Bruce The Bug Guy visited GRRL Upsala on Wednesday, Aug. 13 with a fantastic group of LIVE insects! 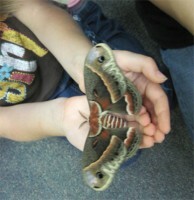 Children and adults met large cecropia moths, Madagascar hissing roaches, millipedes and a tarantula. Bruce taught us about insects, how to handle them, where to look for them in Minnesota, and why we should not fear them. We would like to have Bruce and the insects visit again.